“Tonight is a special night and you are warm and snug. You sipped your final drink and you gave us your nightly hug. Many parenting books now suggest rewarding and praising as a way to cast an obedience spell over your children. While children do seem to have minds and motivations all of their own, there are times when authors think up the most creative solutions to everyday conundrums. In sharp contrast, the most uncreative solutions include ideas like: “Putting your children to bed and letting them cry themselves to sleep.” Sounds fun for the children, doesn’t it? Not only does this book contain a magical formula for getting your children to stay in their own beds, it appeals to your child’s magical inner world. That place where they dream, imagine and wish. Positive rewards work well for other “teaching” moments and so Janie Peterson imagined they would also work well at bedtime. Now, if there it a Tooth Fairy, why shouldn’t there be a “Sleep” Fairy? 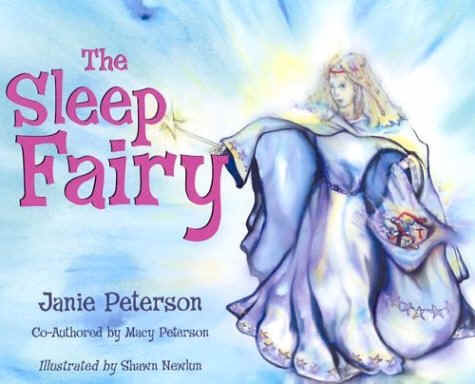 Years ago, Janie and Roger Peterson discovered a delightful Sleep Fairy who helped them teach their children to stay in bed at night. Since then, they have shared this magical solution with other parents who then learned how to sprinkle a little fairy dust themselves. So who is the Sleep Fairy? Well, you of course. It is a job that has the rewards of: no whining, no tantrums, no arguing, no crying and no begging. The Sleep Fairy simply stocks up on a collection of small treats children enjoy. It could be as simple as a bookmark, sticker, ribbon, piece of candy or a tiny toy. The author suggests that you read this story every night when you first start to put this idea into action. Once your children are staying in bed, the sleep fairy then visits them quite often for two weeks. After this, you phase out the routine and tell your children the Sleep Fairy will only be an occasional visitor. The story itself has been designed in vivid colors and the text is warm, snuggly and often rhymes. Molly and Katie are the two girls in the story. They get ready for bed and brush their teeth. After Dad reads a bedtime story, Mom tucks the girls into be and Mom and Dad tiptoe out of the room. “Minutes Later” Molly climbs out of bed and asks for another drink. Then Molly and Katie beg for another story. When Mom and Dad say: “GO BACK TO BED,” the two girls unhappily return to sleep. There had to be a better solution, so the next night Dad reads a “magical story.” He tells Molly and Katie about the Sleep Fairy and suddenly going to bed and sleeping is much more fun. As Molly and Katie snuggle into bed, they have happy dreams and don’t get out of bed. The next morning both girls find a tiny lovable doll. Reading “The Sleep Fairy” is a ingenious way to encourage your children to magically remain in bed. This book has been proven to substantially reduce children’s bedtime problems and night awakenings. Destined to become a Classic Bedtime story. Finally parents can enjoy a peaceful night’s sleep too! of dark wet rocks that almost touch the sky. to melt into the wide green pool below. Richard Jesse Watson's illustrations are the highlight of this poetic journey into nature. Page after page of stunning artwork mingles with a story of a girl in search of her past. She thinks about her grandfather building a small cabin in the woods and family trips when the days get long and hot. There are pictures of her family journeying northwards to seek out treasures. She watches hawks circling in the sky and finally they arrive at the cabin and push open the windows. Soon, the adventurous girl finds her way into a forest filled with animals hiding at the edge of the pages and finally runs to the stream where she dangles her toes in the water. After eating "pawfuls" of berries, she wanders to the magnificent waterfall and then climbs to warm rocks sprinkled with sunlight. She meets an otter and then starts to walk home as the sun hides in the trees. When she returns to the cabin she looks up at the clouds and imagines they look like a dragon. I love the art in this book and this book will definitely inspire trips into nature. The Waterfall's Gift is filled with nostalgia, wonder and an appreciation for nature.